But one thing even fewer people know is that you can experience the famed beauty of Romania’s most famous region, Transylvania, on a bike! “My revenge is just begun! And I spread it over centuries, and time is on my side!” You may recognise this line from Bram Stoker’s famous Dracula novel. And Dracula may be the only thing that comes to mind when thinking of Romania, right? In fact, there’s so much more to discover about this Eastern European destination. With low tourist numbers and few marketing campaigns to promote the country, no wonder people have no idea why they should visit Romania. Vibrant cities with hip crowds, amazing natural diversity, well-preserved traditional lifestyle, organic & delicious food… and much more! The area around Brașov, Sibiu and Sighișoara known as Southern Transylvania will take you more than 100 years back in time. Beautiful and picturesque with rolling hills and towering mountains in the distance, it’s where HRH Prince of Wales bought and restored two village houses that are now his favourite summer retreats. Saxons (Germans) were settled here during the 14th century to set up defences against invading hordes from the South and further East. These well-preserved fortified villages which are UNESCO World Heritage sites are known as the Saxon villages of Transylvania and together with Sighișoara Citadel, also a UNESCO site and the best preserved medieval citadel in Europe, are easy to visit on a bike! A network of 107 km bike and off-road trails was developed in 2011 through the shared effort of locals and non-profits such as ADEPT. 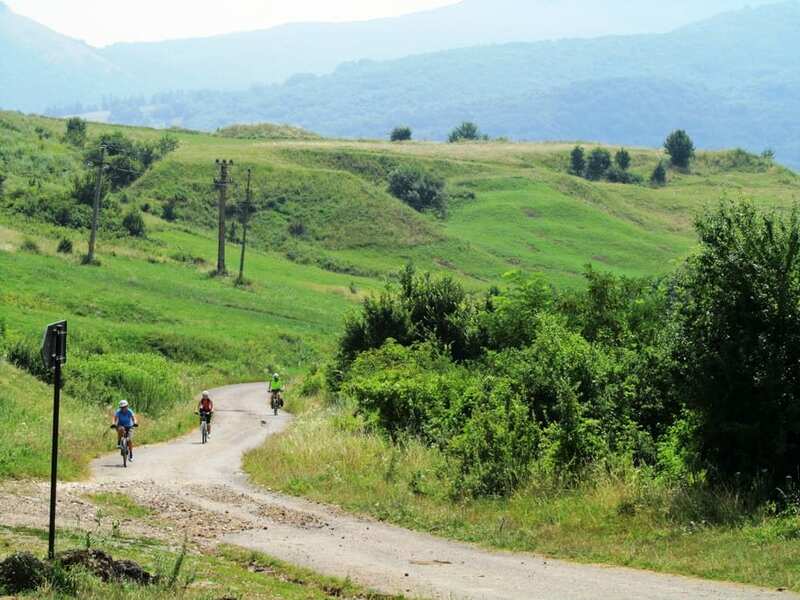 Known as Transylvania Bike Trails (Colinele Transilvaniei), the network connects villages, local tourist sights and beautiful natural spots to encourage visitors to choose slow, eco-friendly and responsible travel in Transylvania. And the region is perfect for this: a land of cultural and natural riches, where traditions, organic food and community ties are greatly valued and preserved. Visitors are welcomed with genuine hospitality by locals eager to show their home, crafts and food products. If you will be able to get up from the table after a meal (aka feast!) you will discover what slow life feels like, disconnected from civilization and modern-day needs. Then you can get on your bike and choose a bike trail that will tame your adventurous spirit. A MTB or cross bike is best for these trails as some are unpaved and not suitable for road bikes. Bike rental shops can be found in Brașov or Sighișoara. Many community events and celebrations are organised during summer, including the annual Transylvania Bike Trail race, and there are also guided bike tours that combine sightseeing and adventure with gastronomy and village life. This is one of the most popular cycling trails in Transylvania. Marked with a red band, completing this 47 km trip will take about 5-6 hours at a relatively reasonable speed with an MTB. It’s a linear trail that you should choose if you’re looking for a full day in nature. Starting either from Sighișoara or Viscri, it will take you through picturesque forests and meadows, soft hills and nice viewpoints where you can admire the beauty of this region. It doesn’t pass through any village so you will need to take enough water and supplies with you. But I promise – it’s worth it! You might need a GPS or a printed map (easy to get from info points or accommodations in the area) because there are some areas without any guidance pillars. You will bike a couple of kilometres on the national road alongside cars until you leave Aurel Vlaicu in front of St. Dimitrie Monastery. There will be some uphill and downhill stretches but not too abrupt or difficult. You can get to Sighișoara by train from Bucharest, Brașov or Cluj-Napoca. Important tourist sights on this route: Sighișoara Citadel and the Fortified Church & village of Viscri, said to be the most beautiful among all the Saxon villages. Take your MTB and leave Brașov (Kronstadt or ‘city of the crown’ by its German name) with Bran as your final destination after a 4-5 hours and 40 km ride. You will have to get to over 1000 m altitude so the trail will be challenging at the beginning, but it’s worth it! At the highest point there’s a viewpoint from where the Fortified Church of Cristian, the Evangelic Church of Rasnov, the city of Rasnov and its citadel on the hill, and Bran Castle (aka Dracula Castle by its touristy name) will make up for the effort. In the cities of Brașov and Rasnov you will go on paved roads but the rest of the trip will be on macadam roads, local driving roads and narrow paths. Another popular trail exploring the wonders of Transylvania, this one will take about 4 hours and 38 km to complete, starting from the village of Bunești. You will be going on paved bike trails with a moderate difficulty level. This trail is designed for visitors to explore the beauty of Saxon villages, so you will get to pass through many of them and visit the Fortified Churches of Bunești, Criț, Mesendorf and Viscri. As you will pass locals, it is customary to greet them and if you see any products on display I recommend you stop to have a look as you might find a delicious bargain! But the best part of this trail will be to see the rural landscapes Transylvania is so famous for! With smooth uphill and downhill stretches, this 40 km bike ride combines off-road paths with paved ones. Criț is famous for its Evangelical church and there are many village houses restored into wonderful guesthouses to choose as your starting base. Bike from Criț to Saschiz, a charming village with a slightly tilted clock tower and rest here because up next are 5 km of straight uphill. But the effort will pay off since you will take the downhill ‘path of the Prince’ to get to Sighișoara. When in this medieval citadel, a stroll on the cobblestone streets is a must, as is visiting the Clock Tower, the Church on the Hill or climbing the Covered Stairs. You can also see here see the house where Vlad the Impaler was born, also known as Vlad Dracul the inspiration for Dracula. Travel tip: try to book accommodation in advance as the Saxon villages are increasingly popular as a tourist destination in Romania and village guesthouses have limited capacity. The best time to travel is May-September. Thank you to Marius Iliescu, founder of Romanian Friend for the guest post. Romanian Friend is a local initiative promoting handpicked tours with the best local guides so travelers can discover the authentic beauty of Romania while supporting responsible tourism. Plan your trip with help from a Romanian Friend and follow us on Facebook or Instagram to see what you can visit!